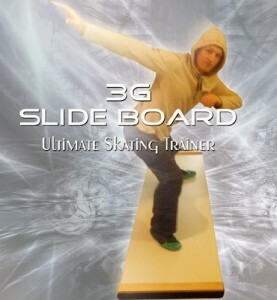 3G Ultimate Skating Trainer Slide Board has a super glide coating and is large in size with the dimensions of 6 x 2 feet- is wider than competitors at this price point. The main activity you will do on this slide board is obviously gliding side to side on its almost frictionless special dry lubricant coated top surface but you can also spin, stretch, turn, jump, do stroking, footwork and imitate an ice skating element and the bottom part will not move or skid as it is solid rubber coated and you will be perfectly safe even on the dance floor or any polished floor. 3G Ultimate is suitable for both home use and in a commercial setting, for anyone that wants a fun exercise tool or pro skaters to get better for competitions as it is commonly used by athletes or teams preparing for Olympics- it is an important part of Russian training programs as it helps you work on the specific muscles you use in skating. It will feel like being on ice when you’re practicing on its super glide coated surface. You will benefit from it greatly for improving your balance, control, landing control, edge quality, muscle strength, manoeuvrability and overall fitness- stamina workout that is more cardiovascular. Slip slide booties are included in the package and they will fit on your shoes easily and will help with achieving the best possible slide. You’ll also find a carry bag and a useful 35 minute DVD Lesson showing you how to do different things properly. 6 ft wide board is mostly adequate for people of all heights or sizes but it will totally depend on your leg strength. Bumpers or borders are made of solid wood- not foam or plastic and they are quite durable but they will not really touch or affect your feet as they will be hitting your slip side booties or shoes. One of the customers reported slipping when they use the board on the carpet (?) rather than polished hardwood floor but others claim the contrary to be the case so it may be that specific type of carpet- by logic the cloth underneath will grab the carpet fabric better than floor, but it would be better if you could hang it on a wall with a hook rather than rolling it for storage. It is not a very cheap slide board but a great quality one that works well and offers quite a challenging workout and many people enjoy this more than running on a treadmill- you do get what you pay for and an average of 4.8 out of 5 stars on Amazon.com says it all.